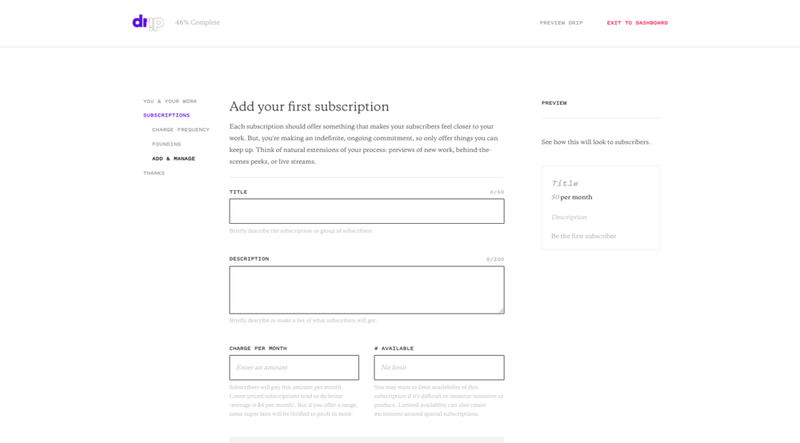 Drip is a new subscription platform from Kickstarter. 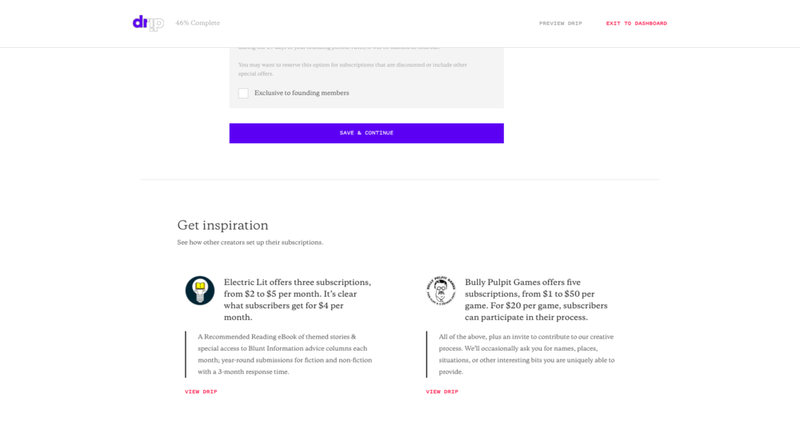 Creators can build community and get ongoing support for their creative practices on Drip. 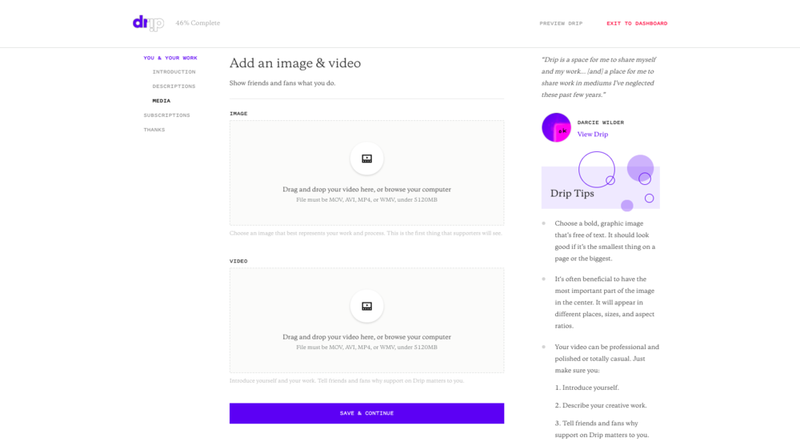 Since January 2018, I’ve been working with Kickstarter and Drip’s product teams to write and edit UX copy for new and existing features, assuring consistency, clarity, and functionality across multiple platforms and touchpoints. I’m also creating comprehensive nomenclature documents and a style guide to support other writers and designers. 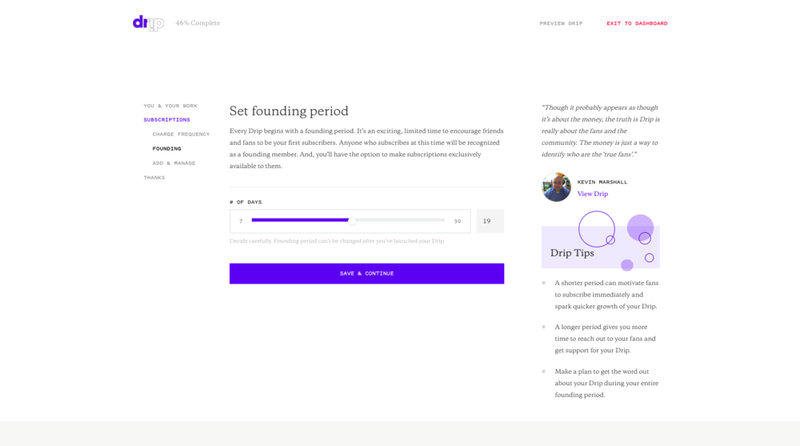 In the new Drip creator build flow, our primary goal was to make it easier for new creators to set up their Drip, to minimize the time both they and Drip’s community team had to invest to get new creators started on the platform. We accomplished this by breaking the build flow into steps and providing help content, inspiration, and examples from other creators within the flow. 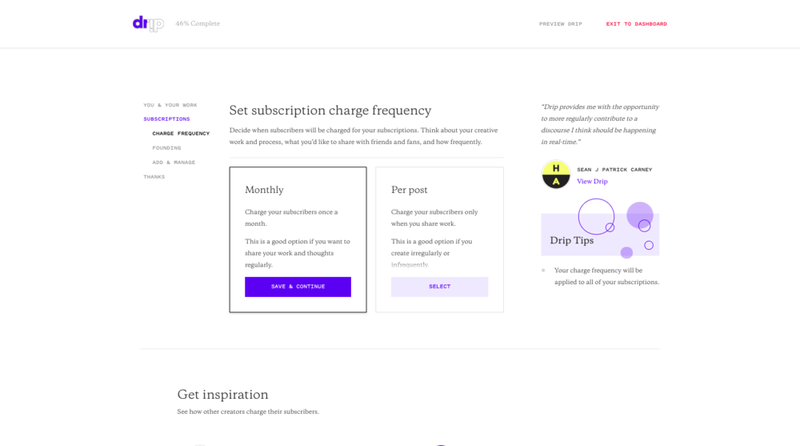 I collaborated with Drip’s UX designers to break the flow into steps, create the sidebar navigation, and organize contextual and inspirational help content. Primary guidance is provided under the capture field. Secondary guidance is in the Drip Tips sidebar. Inspiration to keep creators moving through the build flow is in the upper right corner. Ideal examples from other creators appear below the workspace, under the Get inspiration header. In addition to keeping the copy clear and concise, it was important that the voice and tone aligned with Kickstarter’s: friendly and casual but authoritative. Guidance needed to be unambiguous but also not prescriptive to allow a broad range of creators total creative freedom. 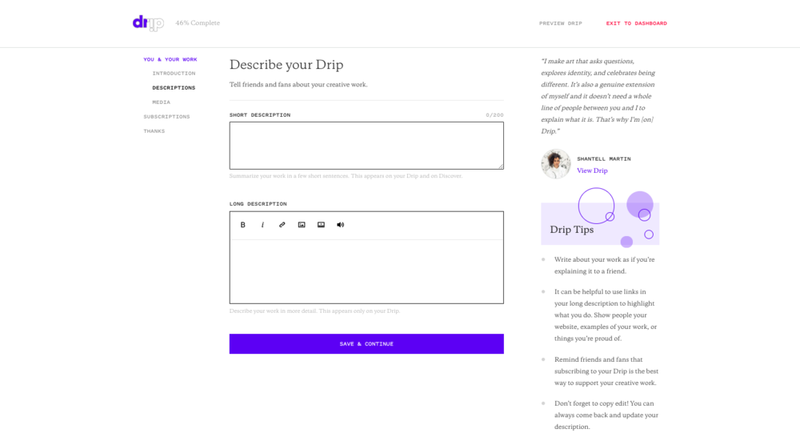 To create the helper text and Drip Tips, I gathered and analyzed feedback from the people that work directly with creators to help them build their Drips: Drip’s community team. Drip’s editorial team helped me identify ideal Drips to use as examples below Get inspiration. The next project launched will be a dashboard that gives creators an overview and checklist of the steps they need to complete, alongside contextual information they need to complete each step.